On April 14th, 2003, the Miami Heat were in Toronto to face the Raptors in the last game of what was a dismal season. Both teams had identical 24-57 records, tied for third worst in the league. Other than sheer pride, there was every incentive for both Miami and Toronto to lose this final game, as doing so would secure a worse record and a higher-percentage chance at a top-three pick in the loaded 2003 draft. Indeed, the Heat went into Toronto and won that game they had every opportunity, and perhaps every reason, to lose — erasing an eight-point fourth-quarter deficit with a starting lineup that included the late Rasual Butler, Malik Allen, Caron Butler, Anthony Carter and Brian Grant. A few months later, on the strength of that loss, it was the Raptors that wound up picking No. 4 overall in the 2003 draft, one spot ahead of the Heat. The Heat, at No. 5, took Dwyane Wade. “Had it been the other way around, had the Heat lost that game and wound up picking ahead of Toronto, they might’ve, or probably would’ve taken Bosh, you know, to go with the size,” Fiorentino said. “They needed a big man at the time, and Pat Riley was always a big-man coach. Instead, they win the game in Toronto and wind up getting Wade, the greatest player in franchise history. That’s no disrespect to Chris Bosh. A great player, of course. Hall of Famer. And we know he ends up helping the Heat win two championships down the road. But the Dwyane Wade-Miami marriage is once in a lifetime. Tony Fiorentino: He was electric from day one. He really was. He just had that magnetic quality. I mean right away he established himself as a big-moment player. Of course, he had that game-winning shot in the first round of the playoffs. Stan Van Gundy, who’s not a coach who easily trusts rookies, he gave the ball to Dwyane to close out a playoff game. What’s that tell you? Fiorentino: So we know Wade was a tremendous athlete, this incredible, acrobatic finisher, and he was so smart. I think that’s one of the things that doesn’t get talked about enough, just what an intelligent and instinctive player he was, right from the start. For example, he never predetermined any of his moves. That was something you noticed right away. He always countered what the defense did. Great instincts. But the one thing was, he didn’t have that outside shot as a rookie, even the midrange. He didn’t come into the NBA with that. Reid: But that shows you he was a worker, right? He turned himself into a reliable, and in the years to come, really a lethal mid-range shooter. And that complemented his drives to the basket so well. It really made him unguardable, especially with that pump fake. Fiorentino: The major problem was he didn’t extend his arm up on the release and follow through. He kind of shot it from his ear. So after his rookie year, after he went to the Olympics in Athens, when he got back to Miami around August or September, he met every day with Erik (Spoelstra), who was an assistant at the time, and they worked on his extension and his balance on his jump shot. And that’s where that relationship started. They spent hours in the gym, and the trust started to build. Reid: There’s no doubt about it. Spoelstra and Wade are going to be linked forever, and Tony’s right on, that summer was really where that player-coach bond started getting built. And listen, especially as an assistant coach, you cannot fool a player for very long. They’ll figure out pretty quickly whether you can help them or not. That trust was built brick by brick and shot by shot. And you saw the results. ** That next season, Wade jumped from 16.1 points per game his rookie year to 24.2 points in 2004-05. He was named second-team All-NBA and All-Defense. Fiorentino: That’s also the year Shaq came to Miami. So now you’ve got Wade coming off a great rookie year and he’s put the work in on his shot, and now Pat Riley goes and gets his great big man to go with him. The Heat go to the conference finals that year and lose to Detroit. Wade gets hurt in Game 5. He hurts his ribs on a shot. He can’t play Game 6 and has to play hurt in Game 7. If that doesn’t happen, Wade might’ve had them in the Finals in his second season. Reid: But of course, the next year, ’05-06, is the one to remember. That first championship. Man, was that special. But it wasn’t looking good after the first two games in Dallas. It took a historic performance by Dwyane Wade in Game 3 to even have a chance in that series. Fiorentino: The Heat got blown out in the first two games. So now we’re back in Miami and down 13 with six and a half minutes to go in Game 3. I mean the series is about to be over. So the Heat call a timeout, and Dwyane comes out of the huddle and says: ‘we ain’t going out this way.’ He’s not really saying it to anyone, but he’s saying it to everyone, you know? We’re not going out this way. Here he is, in his third year in the league, playing with three future Hall of Famers with Shaq, Zo [Alonzo Mourning] and Gary Payton, and he’s the guy taking command. He was always such a confident player, and he was a big-moment player. That’s not true of all players. Even the most talented ones. Not everybody wants that responsibility in those high-pressure moments. But Wade relished that. He ends up scoring 42 points, 13 rebounds, but what everyone forgets is the block he made at the end. That’s what saved the game. Reid: To me, that was one of the more forgotten great plays of Dwyane’s career. Fiorentino: The Heat had come all the way back and were up two. I think there was maybe a second left, something like that. Dallas had the ball the side, and they ran a play where they back-screened, and Dirk threw a lob pass to the rim. It was a perfect pass, and the Dallas player (it was Josh Howard) broke completely free at the rim. It was going to be an easy catch and finish. But Dwyane, and this is his high basketball IQ we talked about, he senses the play happening behind him. He helps back to the basket and jumps and knocks the pass away. Nobody remembers that play, but that was one of the biggest plays in Miami Heat history. The Mavericks had the perfect play at the perfect time, and Dwyane thwarted it with his defense. You talked about Wade getting All-Defense three times in his career, well there it was. He played 100 percent on both ends. Physically, and mentally. Reid: Everybody talks about Dwyane’s athleticism on offense, but he was always so athletic on defense, too. And that was certainly the case on that play. I think that was my favorite Dwyane Wade game, because the Heat had to have it. If they go down 0-3, there is no way they come back. To me, it was one of the greatest performances in Finals history. Dwyane just wasn’t going to let the Heat lose that game. That was his true coming of age as a super superstar. Fiorentino: Everybody looks at the 34 points he averaged in that series, but look at the last four games. Almost 40 points a game. A few years later, there was a ranking for the best performances by an individual player in an NBA Finals, and Dwyane Wade against Dallas was No. 1. Again, almost 40 points a game to lead the Heat to four straight wins. And it was not easy to score in that series. They were low-scoring games, really. You can look it up, Dallas was one of the best perimeter defensive teams that year. Reid: It’s funny, when we went to Dallas this year, José Pañeda prodded him into reenacting throwing the ball high in the air like he did on June 20th, 2006 when we won the championship. He did it at shootaround. Pretty cool. Fiorentino: What you also have to remember about that Dallas Finals, Dwyane doesn’t prefer to just dominate as a scorer. That’s not his game. He had that year in 2009 where he led the league in scoring (30.2 ppg), and he hated it. He said after the season it was the worst season of his career. He made the comment that he never wanted to lead the league in scoring again. He only averaged 30 points because he had to. He didn’t want to, he had to. That team needed him to do that just to be competitive. That’s what made him such a perfect fit with LeBron. He was actually comfortable taking a step back as a scorer and doing more things. Reid: The years have brought a different sort of clarity to how the Big Three came together. It was just a perfect storm that took the superstar executive in Pat Riley, who’s always been this clairvoyant sort of visionary, to see that 2010 summer coming and put the team in position to make the splash moves. And then you had the superstar player in Dwyane who was then magnetic enough to draw in LeBron James and Chris Bosh, and then beyond that, to take the step back, to take less money, to take less of the spotlight, and just let it all work in harmony. That was always one of the hallmarks of Wade’s career, that rare unselfishness, the lack of ego. It’s something you’ve seen at every stage of his career. You think about young Dwyane Wade becoming a superstar before our eyes, when you might understand him wanting to revel in that, but he was at peace sharing the spotlight with Shaq. And they won a championship. Then he does the same thing with LeBron and Bosh, right in his prime he takes a step back, and the Heat win two more championships. 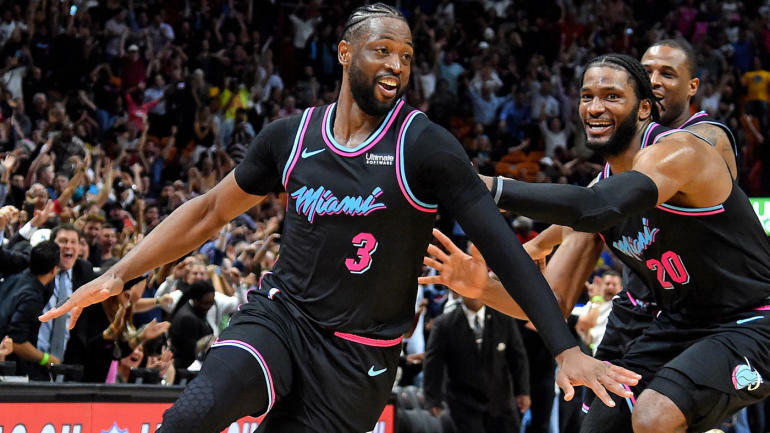 And then maybe the best example, the humility he’s shown in this final act of his career, being willing to come off the bench, being willing to embrace his role in passing down all that knowledge of the Miami Heat way, and really, of the Dwyane Wade way. Make it about winning, make it about the team, and it’ll work out. What a great lesson for Justise Winslow, for Bam Adebayo, for Josh Richardson, and for all these young players to take with them the rest of their careers. Fiorentino: It really shows you Wade’s stability as a person. I always tell people, he’s a better person than he is a basketball player. You hear people say that about a lot of guys, but it’s maybe a little bit for the cameras, you know what I mean? But with Dwyane Wade it’s true. He’s a Hall of Fame person. A Hall of Fame teammate. One of my favorite stories from that Big Three team was in 2012. It was the second round of the playoffs against the Pacers, and it was the year after the Heat had lost in the Finals to Dallas, so there was all that pressure. And now Bosh pulls a muscle in his stomach in the first game of the Indiana series, so he’s out. So the series is tied 1-1 and the Heat go to Indiana for Game 3. Wade gets his knee drained before the game, then goes out and has probably one of the worst games of his career and the Heat lose to go down 2-1. That was a Thursday in Indiana, and the media had a field day between Friday and Game 4 on Sunday. All you heard was Dwyane Wade’s career is over, this team’s done, the Heat are a failed experiment, they never should’ve come together, everything you can think of. So Sunday comes along and we win Game 4. Wade and LeBron combine for something like 70 points (it was 70 on the nose), but the important thing is, Udonis Haslem makes four big jumpers. Wade gives him three assists. Udonis was not having a good series, so Wade kind of gets him going. So now it’s back in Miami for Game 5, and Tyler Hansbrough decides he’s going to destroy Dwyane Wade. Wade goes to the basket, and Hansbrough knocks Wade to the floor. The referees do not throw Hansbrough out of the game. So Udonis comes in the game and he knocks Hansbrough onto Biscayne Boulevard. So listen now, you don’t come to Miami and mess with Dwyane Wade. That’s the message. So we win Game 5, go up 3-2 in the series. But when we get back to Indiana, we find out that Udonis is suspended for Game 6. But we win anyway and win the series. So, on the plane back, Dwyane gets the game ball, and in front of the whole team, he immediately hands it to Udonis. Because Udonis took the hit for him. He had his back. That’s the heart of Dwyane Wade. Meanwhile, after the media wrote all that’s stuff about Dwyane, basically burying him when we were down 2-1, he only scored 100 points over the next three games. And we go on to win the championship against Oklahoma City. Reid: You go back to that game Tony talked about in 2003, against Toronto. It really was ironic, that team had been trying to win all year and couldn’t, and now they have this game everyone says they should lose and they win. But they played that game purely. No agendas or tanking. So I like to think Tony’s right about that. They end up getting rewarded with not just Wade in the draft, but then to get Bosh, too, in 2010. That was just such a special time. The way it came together. The brilliance of those three playing together. To call games for that team, man, what a privilege. What an honor. Fiorentino: It was a thrill a minute. It seemed like every game you saw something you’d never seen before. Reid: And of course you have to talk about those two Finals against San Antonio. That was some of the best basketball I’ve ever seen. There is such a respect between those two franchises. What Gregg Popovich did in Wade’s last game in San Antonio was one of the real goosebump moments of this whole farewell season. To come out an present him with the signed jerseys of Duncan, Parker and Ginobili. And for that crowd to rise to their feet. That’s true respect born out of 13 Finals games against each other. You can even think about when Wade left for that year and a half. When he got traded back here, I believe, it was largely because of the respect that everyone has for Dwyane and that was something you knew he’d appreciate. But the Cavaliers didn’t have to do that. Teams don’t do that for very many players. I’ve been in the NBA for 31 years, and that might be the most benevolent transaction I’ve ever seen. Fiorentino: I don’t think what went on this year in different NBA cities, all the tributes, just the respect that’s being shown, I don’t think that’s just about him being a great player. I’ll say it again, I think fans and all the players realize what a great person he is and that he always did everything with class. I don’t know if this fits into your story or not, but last year (2018), in my last game announcing for the Heat, they honored me at halftime. After the game, I park where the players park, and there was a bag on my hood. It was an autographed jersey by Dwyane Wade with a message on it. I’m reading it right now. It says: ‘To Tony, listening to your voice for 13 plus years will stay with me forever.’ Pretty cool gesture. And he didn’t do it during the ceremony or anything where all the people could see. That’s not what Dwyane is about. That really meant a lot to me. It’s really cool that he did that. It makes me remember a lot of great times just looking at it right now. And we all have Dwyane Wade to thank for so many of them. Reid: I recently did a podcast with a guy who interviews play-by-play guys, and I talked about no matter what level you’re announcing at, a great player takes a broadcaster to another level. My first job, I’m doing Cornell football and we had a sophomore running back by the name of Derek Harmon who went on to play in the NFL, and I’m convinced that this one Derek Harmon run that I put on my little resume tape got me my next job. So, guess what, Dwyane Wade has been my Derek Harmon 10.0. I’ve always thanked Dwyane. I’ve told him you have made me so much better as an announcer, and he comes back and says you’ve made all my stuff sound better. No. It’s the other way around. What an honor to be the voice track of Dwyane Wade’s career. I mean I sit here and I think about all the calls. I mean I’ve made a million of them. But I have to say, I think of all the game-winners, it’s the last one, against Golden State, that I’m going to remember the longest. In 31 years, I’ve never gotten so much feedback to a singular call of a play than that play. And I loved it because it epitomizes everything a broadcaster goes through in terms of all the preparation you do is secondary to how you react to the spontaneous. And that moment was so spontaneous. I’m thankful that my call lived up to that moment. And the reason that particular call got me so much attention isn’t because of me, it’s because who made that shot, and when he made it, and who he made it against. If you look back at that celebration, when Wade is standing on the table, I said: “That just happened.” That’s Dwyane Wade and the Miami Heat. All of it. Sixteen years. It all just happened. And we got to be here to experience it. What a ride.